I've gotten in plenty an argument with people about what constitutes film noir. Since it was an organic artistic movement rather than an organized one, there is no manifesto to clearly outline what the style encompasses and what is just a pretender to the darkness. The loosest way to describe it is a certain style of crime film that emerged in the 1940s and carried over into the 1950s, movies with similar thematic obsessions and aesthetic hallmarks that critics were later able to identify and lump together. Though the term "film noir" was actually coined in the mid-40s, it really didn't take off until the 1970s. Needless to say, no one who ever made an actual film noir ever said to someone, "Oh, yeah, I'm shooting a film noir right now." And frankly, if you ever hear someone tell you that's what they're doing, look them dead in the eye and say, "No, you're not." Which bring us to Olive Films' Film Noir Collection, Volume 1. Though titled to get directly to the point, I do have to wonder of the wisdom of such a generic banner. I already own a couple of collections with similar titles, some from big studios and some fly-by-night collections of public domain material. In most cases, the films contained in the sets are only disparately related, maybe even less so than the quartet gathered here. The only real thing they have in common, outside of a coincidental crossover of some cast and crew, is they were pulled from the Paramount vaults by Olive, and all have previously had DVD releases (most of them from the summer of 2010). This is their first time on Blu-Ray, and so Olive had decided to repackage them as a set. And a good set at that, all the films being above average in terms of quality and packing a lot of star power. The leading men alone are Charlton Heston, William Holden, Burt Lancaster, and Alan Ladd, but there is also a great selection of famous character actors like Peter Lorre, Jack Webb, and Ed Begley. 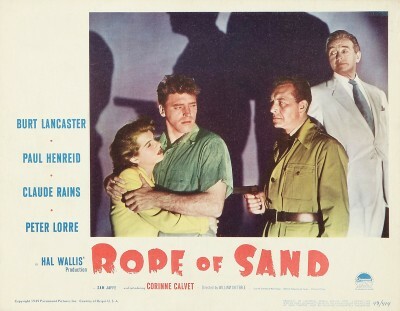 Most of the entries are parked close to film noir's urban landscape, with really only one, 1949's Rope of Sand, making for a questionable choice. It's actually one of the two best movies in the box, but noir is generally connected to the city. An African desert, not so much. 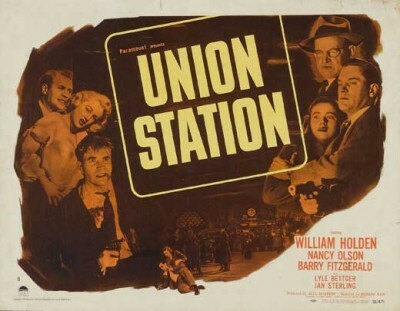 UNION STATION (1950; 81 minutes): You want to know how bad the bad guy is in Union Station? When he takes a clerk in the parcel room hostage, he forces the man to watch him eat his lunch at gunpoint. It's bad enough he's going to order the dude around and make him an accessory to a crime, he's got to scarf his sandwich, too! The 1950 film Union Station is essentially a race-against-the-clock drama. When office girl Joyce Willecombe (Nancy Olson) spots a man with a concealed weapon on her train, she inadvertently exposes a kidnapping plot. Lt. William "Don't Call Me Willy" Calhoun (William Holden) thinks she's a crackpot at first, but after tailing the gunman (Lyle Bettger), they discover that he has abducted the blind daughter of Joyce's boss. The police play along with the plot, trying to string the crooks along long enough to figure out where they're hiding the girl (Allene Roberts) before they kill her and take off with the ransom. Union Station is directed by Rudolph Maté (D.O.A., The 300 Spartans) from a script by Sydney Boehm (The Big Heat). It's a decent thriller, marked by some spectacular sequences, dragged down by others. When the action stops, the movie tends to slow to a crawl, but when the police are on the hunt, including a climactic chase in the tunnels under the train station, Maté reminds us that he has a pretty strong skill for building tension. Holden dials down some of his usual charm, going for a more gruff persona here, and in terms of the drama, Boehm creates a good dynamic between Calhoun and his witness. Romance blossoms slowly, as Joyce challenges the cop's steely demeanor. He makes a strong case for an investigating officer checking his sentimentality at the door, but ultimately succumbs to the emotional pleas to make sure the kidnapped girl gets out alive. 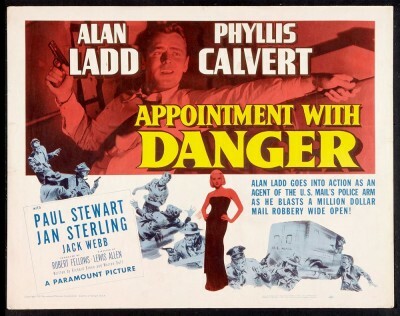 APPPOINTMENT WITH DANGER (1951; 89 mins. ): Crazy! A movie with a pre-Dragnet Harry Morgan and Jack Webb as two hoods who murder a postal inspector. That's pretty cool, though once that initial surprise passes, settle in for a fairly average crime thriller. Alan Ladd stars as Goddard, the post office man assigned to figure out who killed his colleague. The trail leads him to a nun (Phyllis Calvert, Madonna of the Seven Moons) who accidentally saw the killers, and then to the gang that set the whole thing off. Webb plays sadistic bad man Joe, part of a small-town crime ring set to rob a mail truck for a cool million. Paul Stewart is the businessman who leads the would-be crooks, and they operate out of his hotel. Once undercover, Goddard tries to see the heist through to completion, hoping to catch the thieves with their hands in the mail bag. Following the opening scene, things go a bit wonky. Goddard's tracking down the nun requires a heavy suspension of disbelief, as director Lewis Allen (Suddenly) and writers Richard L. Breen (the original Dragnet movie) and Warren Duff (Angels with Dirty Faces) take some pretty lazy short cuts. From there, the plot builds slowly, saving any real tension for the robbery itself. Last minute complications mean things get a little tight for the stuffed-shirt postal inspector. Ladd works his usual stoic routine, though at least here the filmmakers have some fun with it. There's a great running gag where people rib Goddard for being an unfeeling robot, devoted to the job above all else. For those looking for great pulpy one-liners, Ladd has a couple of memorable retorts, and he also has a couple of good scenes where he verbally spars with Joe. "Sure I know what love is. It's what goes on between a man and a .45 pistol that won't jam." What's most interesting about appointment with danger, though, is that that despite the nun being set up to be the one who teaches the dopey cop to have a little heart, her role is superseded by the top gangster's moll. Jan Sterling (Ace in the Hole) plays the sensual femme, though this one is not quite so fatale. Goddard is taken with her easy manner and practicality, and the girl gets a surprising scene midway when she describes her role as being neither the good girl nor the bad one--she is the lazy one, content to go along. Weirdly enough, it's a fairly progressive way to portray the loose blonde. She's smart enough to know how to survive in a harsh world with her dignity intact. Allen's direction displays very little by way of style, so there aren't too many noir hallmarks on display here. Still, it's a fine enough B-movie, intermittently entertaining. DARK CITY (1950; 98 mins. ): Charlton Heston plays the heart and soul of a gang of con men and card sharps. Constantly harassed by the local cops (led by Dean Jagger), Heston's Danny is looking to make a big score and move to Vegas, where everything he wants to do isn't just legal, but encouraged. When a G.I. with a cashier's check (Don DeFore) crosses his path, Danny takes him to his private card game. There, his cohorts (Ed Begley and Jack Webb) pull some dirty tricks, forcing the man to sign over money that isn't his. Danny doesn't like it, but them's the breaks. Except, the morning paper brings news of the man's suicide by hanging, and before long, one of the other crooks is killed in the same manner. The mark had a brother, and that brother is hell-bent on killing the men he believes are responsible for his younger sibling's death. Heston and Webb head to Las Angeles to try to find the homicidal maniac before he can find them. There Danny gets tangled up with the victim's widow (Viveca Lindfors), who wants nothing to do with him once she realizes who he is. Trying to stay one step ahead of the noose, Danny heads for Vegas at last. Dark City is a smartly plotted, tightly paced thriller. Director William Dieterle (The Devil and Daniel Webster) adopts an efficient, no-nonsense style, preferring a quiet burn to full-tilt frenzy. Heston is solid as the stoic man in conflict. His bad deeds are meant to blot out a rotten past, but there is no forgetting past failures. Noir-regular Lizabeth Scott shows up here as a singer with a yen for Danny, and it ends up being one of her better performances. Her turn as Fran is surprisingly tender, reliant more on the anxiety of the girl who expects to be left behind than the more standard tropes of either the femme fatale or the homey salvation. Though arguably short on action, Dark City makes up for its lack of shootouts with its pseudo-Hitchcockian scenes of revenge by strangulation, and the final tense moments in Vegas give way to a surprising twist: redemption and love. Oh, and this one also features Harry Morgan, so this team-up between him and Jack Webb not only predates Dragnet, but Appointment with Danger, as well. ROPE OF SAND (1949; 104 mins. ): Not really a film noir, but rather a pretty blatant grab at Casablanca's unique territory. Indeed, the two films share a producer in Hal Wallis, and he originally intended the picture as a vehicle for Humphrey Bogart and Ingrid Bergman. Instead, he settled for a bunch of Casablanca's supporting players: Paul Henreid, Claude Rains, and Peter Lorre. Burt Lancaster stars in Rope of Sand as Mike, a former hunter and tour guide who returns to Africa after two years in exile. He had previously run afoul of the local law enforcement, a sadistic commandant named Vogel (Henreid), when a man who hired Mike strayed into prohibited territory in search of diamonds. Everyone believes they found some, and that Mike knows where they are hidden. Stirring the pot is the aristocrat Arthur Martingale (Rains), who has an intense dislike of both Vogel and boredom. He likes pitting the men against each other for his amusement. To put them at odds, he hires a French con woman, the foxy and thus appropriately named Suzanne Renaud. She is played by Corinne Calvet, who first appears on screen in a lacey outfit appropriate for a sneak thief. It's maybe the sexiest dress I've ever seen in a classic film, illusory in what it doesn't reveal, pleasing in what it does. Rope of Sand is a bit of a chess game. Who is really loyal to whom, and what ramifications will each move have on the overall scheme? Suzanne bounces between both men before, of course, settling on Mike, but Vogel still has dirt on her and the rivalry between him and Mike runs deep. Sometimes one is up, but then the scales tip back down. It's a pretty good yarn, full of card games, secret maps, and drunken philosophers. Lancaster is at his most granite here. He reportedly hated being in the movie, and the real-life tension adds to the performance. Mike has an aura of constant irritation, it's believable that he wants to be as far from where he's at as possible. 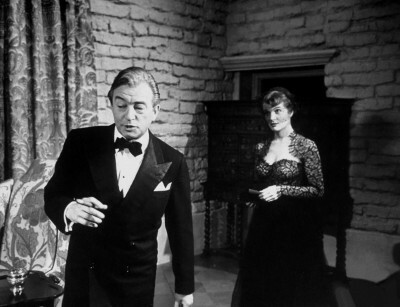 Henreid and Rains make for formidable opponents, but Calvet isn't a very good actress. So bad that I presume what is her real French accent actually ends up sounding like a put-on. Thus, the romance fizzles even as the action runs strong. Despite the obvious comparisons to its more famous predecessor, Rope of Stand still manages to stand on its own quite nicely. 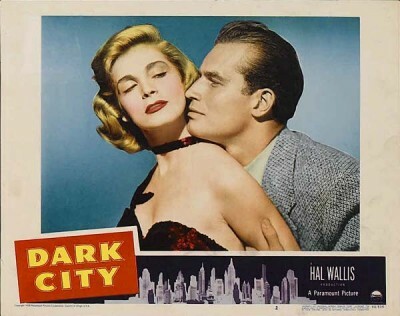 Director William Dieterle (who also directed Dark City) uses the exotic locale effectively, creating an isolated environment for his drama to play out. There's a few good twists and turns on the road to the end, and one awesome fistfight in a sandstorm that is well worth digging up all on its own. All four films here are black-and-white and shown at a 1.37:1 aspect ratio. The prints are uniformly solid, with very little in terms of dirt or scratches on the image and decent resolution throughout. Union Station suffers in its darkest scenes, looking almost as if someone has dropped a screen over the lens. In the more balanced scenes, the shadows come off better. On the same front, Appointment with Danger has several scenes that are pretty scratchy, like those sections have been scraped along a jagged edge running through the projector. It happens a handful of times, making it all the more noticeable how nice the unaffected sequences look. Dark City is very clean throughout, with the exception of the scenes where Heston first visits his victim's widow. There is this odd shimmer, almost like it's being projected on a screen underwater. It's probably the best looking, with Rope of Sand, which only has the most minor of marks, close on its heels. All the movies have their original soundtracks mixed in mono. The audio is clear and comes through nicely, without any unnecessary hiss or glitches. None. The four Blu-Ray discs come in a thick plastic case with trays for all of them, and that fits inside a nice slipcover. Highly Recommended. Though a packaging of convenience more than a curated set, Olive's Film Noir Collection, Volume One manages to be a fairly solid quartet of B-crime pictures with an A-list cast of stars. Some films are better than others, but all have something to recommend them. The best of the bunch are the two directed by William Dieterle, Dark City and Rope of Sand, even if the latter doesn't even really fit into the loosest definition of film noir. If you like black-and-white movies with tough guys wearing trench coats and packing pistols, wrestling with their enemies while wrestling with their own existential condition, then Film Noir Collection, Volume One is a winner.